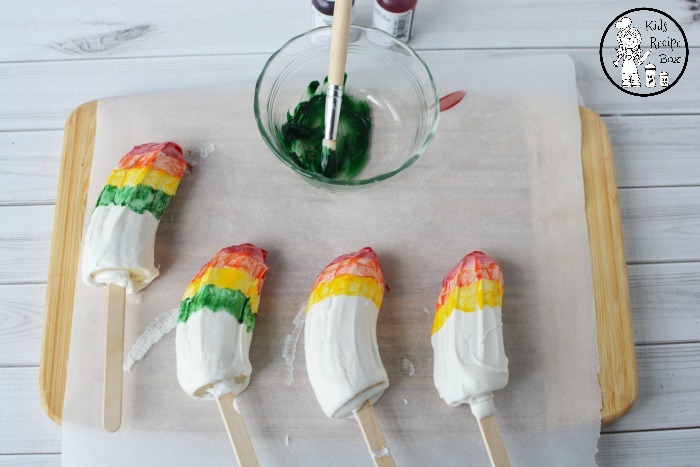 How cute are these Rainbow Banana Popsicles?! Bananas are a favorite around our house! Needless to say, bananas never last long. I always have them on the top of my shopping list because we always run out. My kids love to eat them plain. 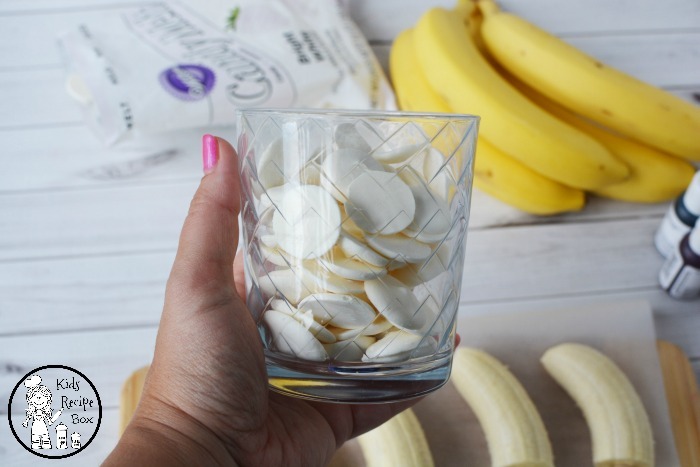 hey are a favorite ingredient for smoothies and banana splits are the ultimate treat. My girls even love peanut butter and banana sandwiches. I wish I could have a few banana trees in my backyard, but the climate around here won’t allow it! 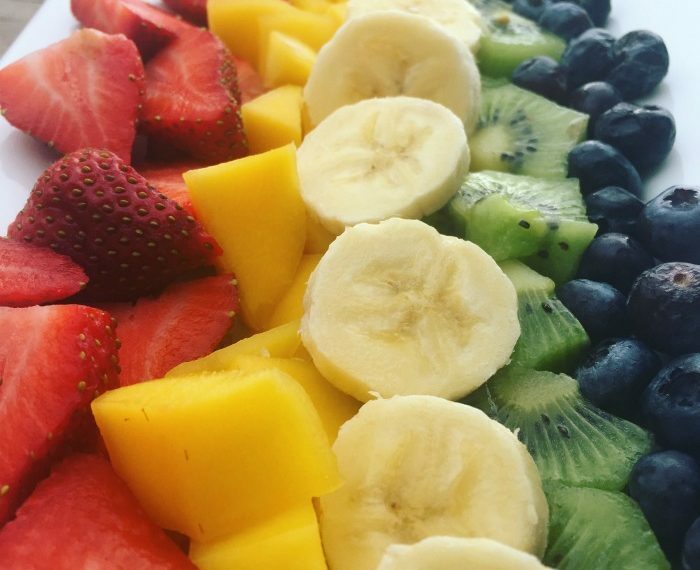 If your family just happens to love bananas like my family, then this post might just be up your alley. 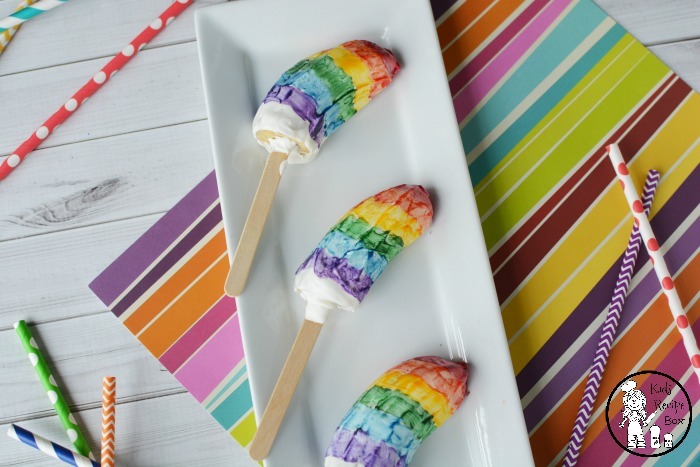 This Rainbow Banana Popsicle Recipe is a delightful healthy treat on a warm summer day. They’re fun to create too. 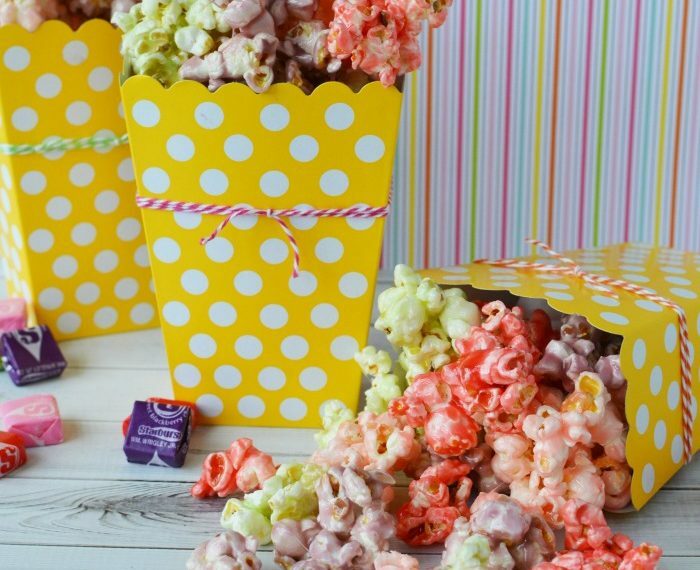 Spending the afternoon making this treat would bring a smile to any kids face. 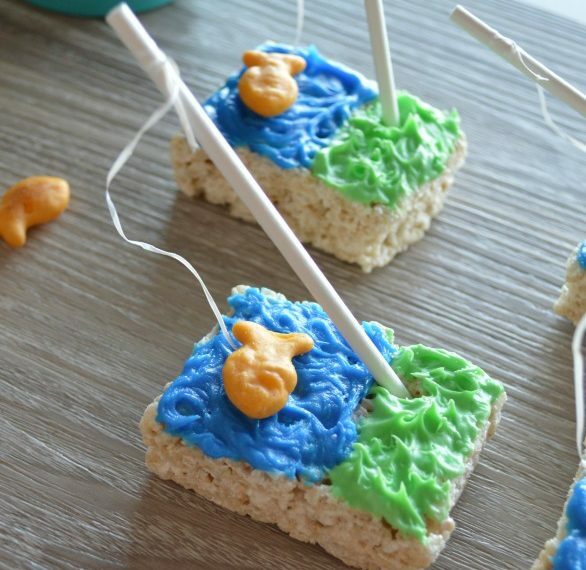 What kid wouldn’t love painting their food? 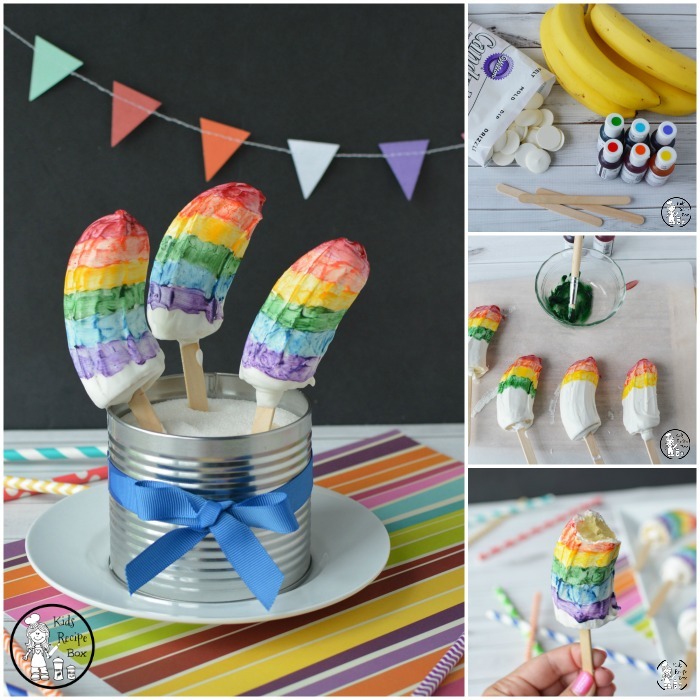 This Banana Popsicle recipe is also a great treat to serve at any upcoming parties…especially for those banana lovers in your life. 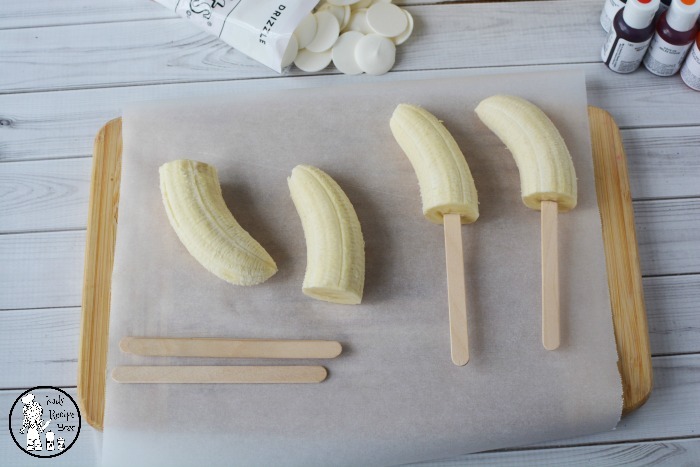 Make sure and have fun while making this fun Banana Popsicle recipe! Place wax paper onto a small cutting board. Cut the bananas in half and remove the peel and discard. Place a stick into the center base of each banana, gently pressing it as far into the banana as you can before it comes out the other side. Place half a bag of candy melts into a drinking glass. Microwave according to the package directions (60 seconds on 50% power, then stir and return to the microwave if necessary). 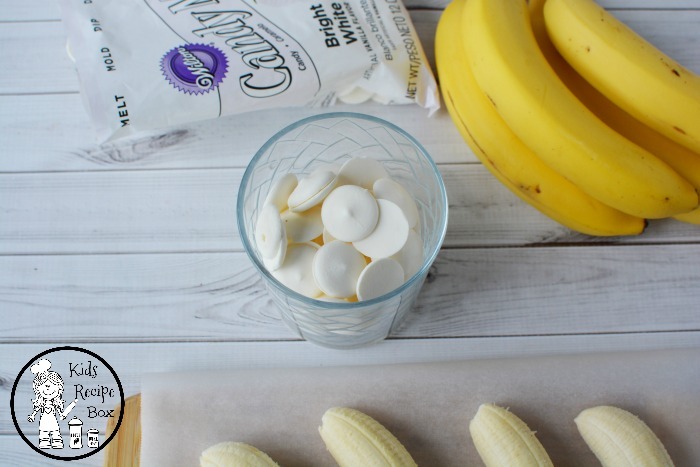 Dip the banana into the candy melts. 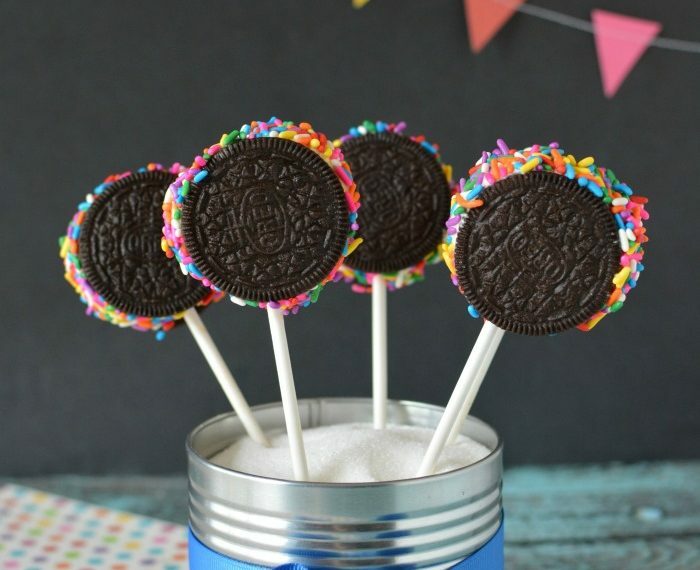 Use a spoon to wipe away the excess candy melts. I wiped from the base/stick to the top of the banana. Set on the wax paper to harden. Repeat for the desired number of bananas. 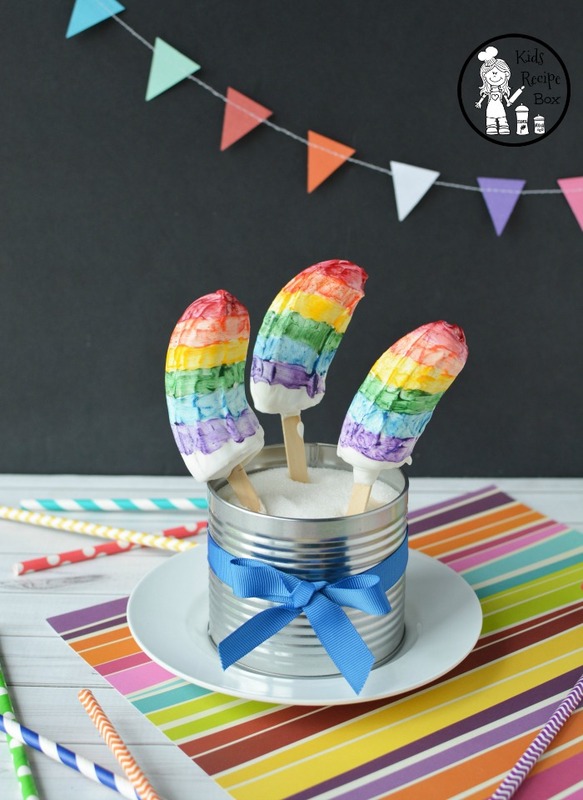 Don’t these look like popsicles all ready? 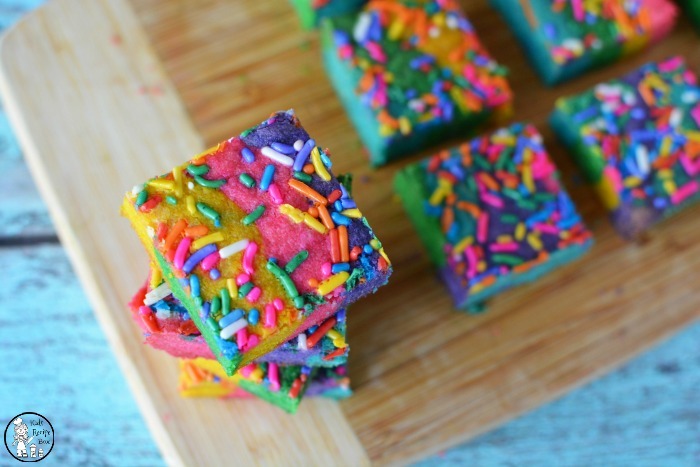 Once the candy melt coating is hard, place 1/4 teaspoon shortening into a small dish and microwave for 30-60 seconds or until melted, or nearly melted. Stir with a toothpick until completely melted. Add a drop of red food coloring and stir well. 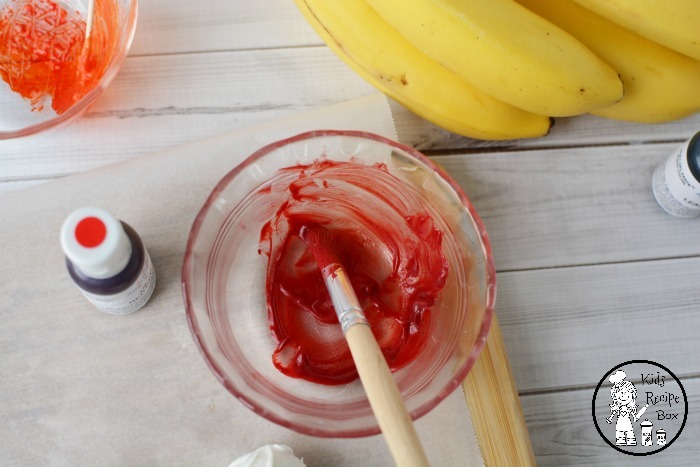 Use a clean paint brush to add red food coloring onto the top of each banana. Set aside. 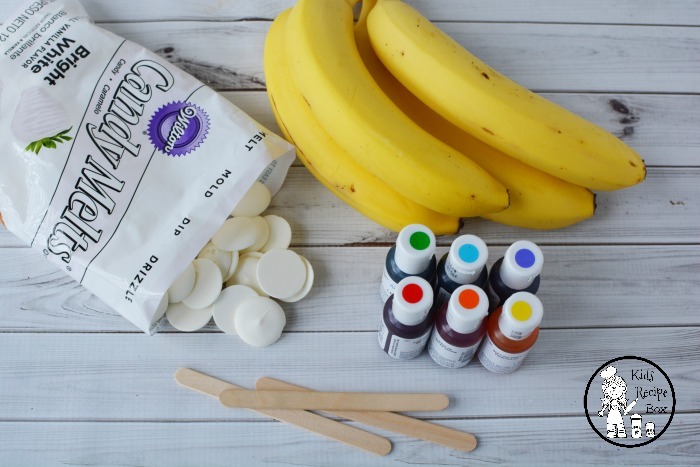 Repeat with the remaining 5 colors and set bananas on wax paper to set. 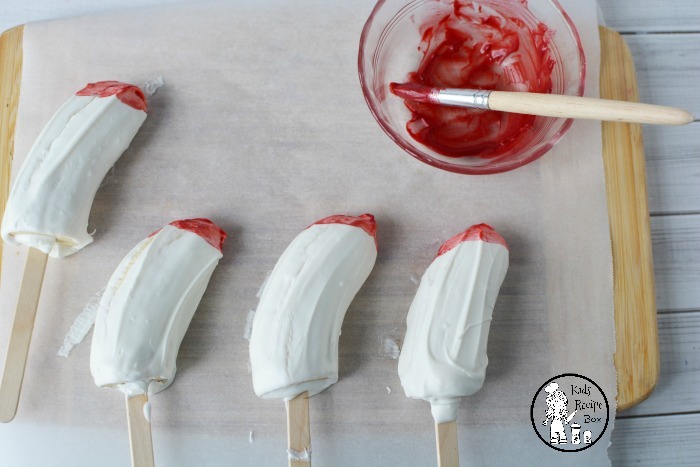 Place into the freezer if you’d like frozen bananas or place into the refrigerator until ready to serve. 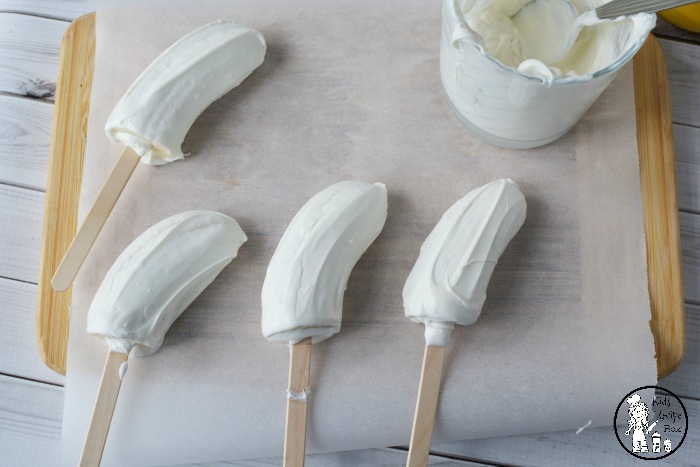 Just like that your Banana Popsicles are finished. Just be sure you have enough to go around! 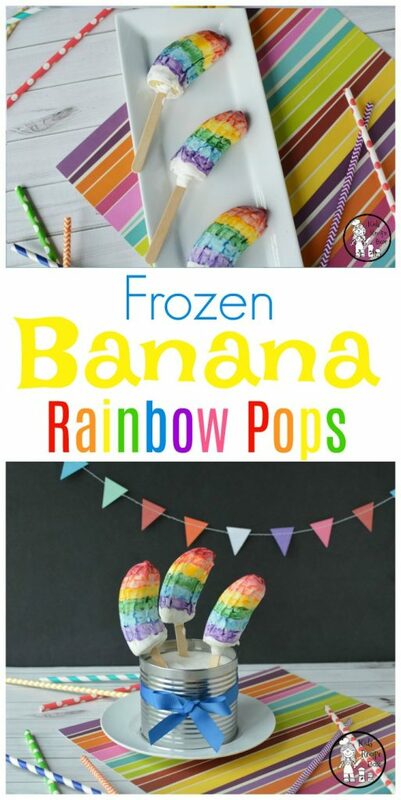 Enjoy this Rainbow Banana Popsicles Recipe! Copyright Amy Nielson 2017. Clipart Design Credit to Jeanette Baker @ Jason's Online Classroom.